Ocean Princess (formerly R Four, and Tahitian Princess) is an R-class cruise ship owned by Princess Cruises. She mainly sails around the French Polynesian islands, Society Islands, Cook Islands, Marquesas Islands, and often sails to Hawaii. She also spends northern hemisphere summers in Alaska. Her sister ships are Pacific Princess and Royal Princess. 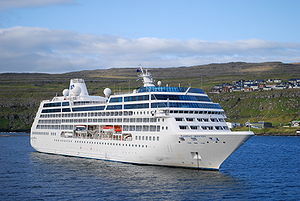 In November 2009 the Tahitian Princess was renamed Ocean Princess to "reflect a more global theme". 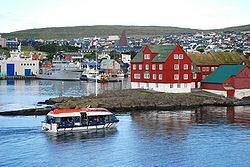 The vessel entered operation in 1999 under the flag of Renaissance Cruises. The ship was not owned by the company; instead she was owned by a group of French investors. When Renaissance declared bankruptcy in 2001, the ship was seized by creditors, along with the other seven vessels in the fleet. In 2002, Princess Cruises secured a two year lease for R Four and her sister ship R Three (now Pacific Princess). The vessel entered operation at the end of 2002, and was renamed Tahitian Princess. At the end of the lease, Princess Cruises purchased both vessels. ↑ 1.0 1.1 1.2 1.3 1.4 1.5 1.6 1.7 1.8 Asklander, Micke. "M/S R Four (1999)" (in Swedish). Fakta om Fartyg. http://www.faktaomfartyg.se/r_four_1999.htm. Retrieved 2008-03-23. ↑ 2.0 2.1 2.2 2.3 Ward, Douglas (2006). Complete Guide to Cruising & Cruise Ships. Singapore: Berlitz. pp. 609–610. ISBN 981-246-739-4. ↑ "Tahitian Princess Deck Plans". Princess Cruises. http://www.princess.com/learn/ships/ta/deck_plans/ta_deck_7.html. Retrieved 2008-03-23. ↑ "Tahitian Princess to be renamed Ocean Princess to reflect better new deployments". Cruise Business Review. Cruise Media Oy Ltd. 2008-04-04. http://www.cruisebusiness.com/news.php?u=20080403173156. Retrieved 2008-04-03. 8 August 2010, Dartmouth, Devon, on a cruise starting in Dover. She left the same day, bound for Waterford. She came in forwards and had to go further up river on leaving in order to turn, which she did in her own length without the assistance of a tug. There is a video of the manoeuvre below. 12 June 2008: The Tahitian Princess is back at Canada Place after cruising to Alaska. 15 January 2010: Ocean Princess first time visit Hong Kong in 2010 E.T.A. 0800Hrs 12/01/2010 E.T.D.1800Hrs 13/01/2010 Keppel Shipyard in Singapore has been entrusted with a refit to Tahitian Princess (built as R Four by Chantiers de lAtlantique in 1999), which will not only undergo a makeover but also get a new name. The Princess Cruises vessel will be transformed into Ocean Princess during a two-week upgrade project. The scope of work includes a new hull coating with an energy-efficient silicone paint, as well as various interior refurbishments, including new upholstery, carpet and flooring. 8 August 2010 in Dartmouth, Devon shows the Ocean Princess heading up river on leaving Dartmouth to turn in her own length between the Dart Marina and the Sandquay naval dockyard. There is only just enough width of river to make the turn. No tug is used. Ocean Princess appears only to have bow thrusters, so makes the turn amazingly well under the command of the Dartmouth Pilot. This page was last edited on 9 August 2010, at 17:12.